As always, I hope this new blog finds you all well and in good health. Summer is in full swing now and it seems the juice and health KICK is definitely flowing with many high street stores being sold out of juicers! The UK showing of Joe Cross's Fat, Sick & Nearly Dead last month made a massive impact on people's thinking (and in some small way, I'd like to think this blog is influencing some healthy thinking and ch-ch-ch-changes within our Rhythm family. Someone else who's making a big impact on our drumming community is my guest in this week's blog. We first met last year when she came to Liverpool while on tour and blew me away with some tasty, solid grooves, her 'mature ear' for the song… and biscuit obsession! She's a London drummer (born and bred) who's been touring for the past six years, with artists such as Bryan Ferry, Cher Lloyd, Tricky, Emilia Mitiku and The Hours. You can hear her on these albums: Bryan Ferry's Olympia, The Hours' See The Light and Peter & Kerry's La Trimouille. "I've never been particularly healthy or unhealthy in my diet and never really been overweight, but have have always been interested in eating things to make you feel good and looked into many types of diets or rather traditional healthy ways of eating. For instance I went through a massive 'Japanese phase' of every morning having a traditional breakfast of grilled fish, rice, miso soup, seaweed, pickles and various other things. It made me feel great! So healthy and set up for what the day had to offer, but after a while it became more and more difficult to uphold so I moved on to other diets which then became difficult to uphold so I'd stop, and the cycle would continue. "Then around two and a half years ago I saw a Vitamix demonstration and when they were talking about being able to drink things you wouldn't usually eat to get the nutrients without having to necessarily taste them, I thought, this is for me! I became obsessed. I then started looking up what the healthiest foods were to eat for overall health and started blending them up into (at first gross) smoothies. I immediately felt a difference in my overall energy and even how clearly I was thinking. "After about six months of doing this religiously, daily I started to slip and not make as many smoothies.… they became an effort to drink, and were so heavy in your stomach sometimes when you wanted something lighter. Then I ran into Steve Barney and we started chatting about that side of things and juices… and I thought, yeah I do that occasionally, I'm healthy, it's cool. He then sent me a link to the film Fat, Sick and Nearly Dead and that's when the passion for it all came flooding back! It all made so much sense again! I also had a similar skin condition to the main guy in the film and thought 'maybe I can sort this out with juice'. So I got hold of a juicer and haven't looked back! 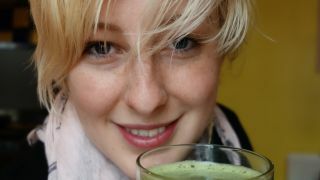 "I enjoy juicing things that will benefit my body with foods with antioxidants and healing properties, as well as energy boosting - which is essential when trying to maintain a career in music! The mad hours, the lack of sleep, the jetlag, and the general unbalance of it all has been made so much more manageable by juicing! And if I don't have a juice for a couple of days I really start to feel it! I feel lethargic or a bit fuzzy headed. As soon as I have that hit though, I'm all good again! "Juicing also makes me want to look after my body in different ways, for instance in making sure I exercise, even as simple as something like walking for an hour a day (my current regime), making sure I drink enough water in the day, or just getting enough sleep (that's more rare). I" must say that my favourite thing about juicing though is the fact that I know what I'm putting into my body, I know I've had lots of nutrients, so I don't feel so bad when I let myself have a little treat! (Borders Dark Chocolate and Ginger Biscuits are my vice at the moment!) That's always a nice feeling… as long as you don't overdo it!" "I prefer veg-based juices to sweet ones, so this one is not very sweet but very refreshing." "This one is sweeter, more of a treat and nice in hot weather… goes down very smoothly!" For more on juicing, check out Barney's healthy inspirations.